Human Rights Activist News Agency (HRANA) – Journalist Masoud Kazemi was released on bail Sunday, November 11th. He was arrested in his home November 5th, one day after tweeting critical remarks about Iranian authorities. Kazemi is the editor-in-chief of Sedaye Parsi, a monthly political magazine. 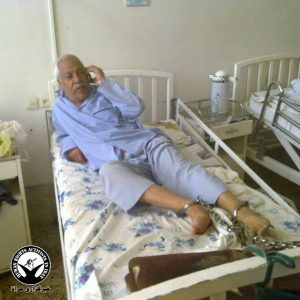 Retired teacher and current union activist Hashem Khastar, who was arrested and sequestered in Mashhad’s Ibn Sina hospital psychiatric ward for unknown reasons October 23rd, was released November 10th. He has no history of mental illness. During his forced hospital admission, Khastar’s family and friends were arrested for gathering outside Ibn Sina to demand his release. On June 21, 2018, Khastar was placed in a Security Police detention center on Abbas Abad (formerly Vozara) street for participating in silent teacher protests. In 2009, he was arrested in connection to widespread protests following that year’s Iranian presidential elections and was fined by Iranian courts for two letters he wrote from Vakilabad Prison. He was released, only to be arrested again later for refusing to pay the fine.